I thought it might be fun to share some of my favourite pieces from our Summer Vignette. I must say we had so much fun putting together our collection of special things for this season. There are so many things I absolutely adore. 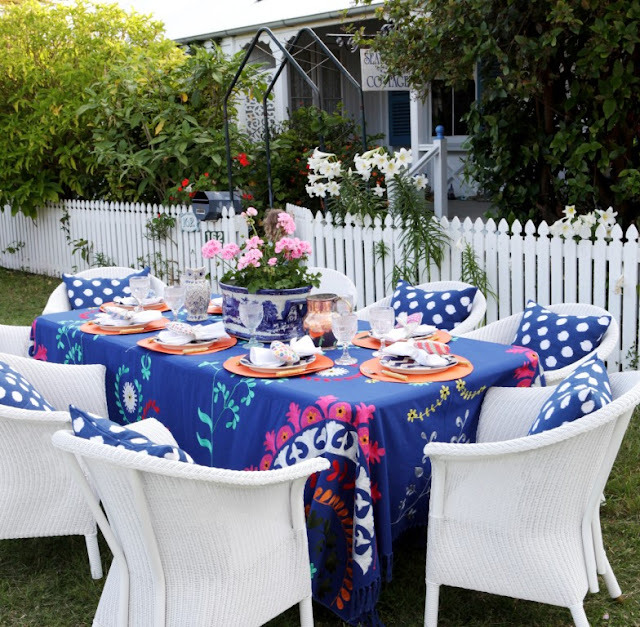 One of my most favourite things is the beautiful embroidered tablecloths. When we found them I was so excited about them. Although we featured the red one for Christmas I really love the blue one. They are so gorgeous and so beautiful in the flesh. 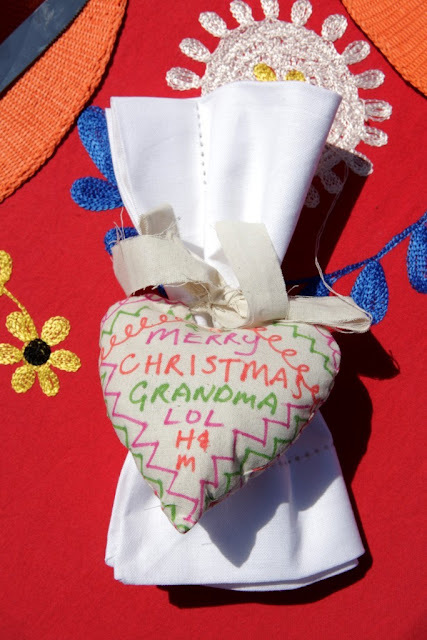 I also love the calico love heart decorations which Kelly at Black & Spiro hand-made and Harry & I decorated with felt pens. I really wanted to encourage a hand-made Christmas decoration which you can purchase and then enjoy decorating with personal messages and illustrations with your children. The other thing I love about them is that you can tie them onto your tree or you can use them to tie around your table napkins. You could even write each person's name on them as place cards for the Christmas table setting. 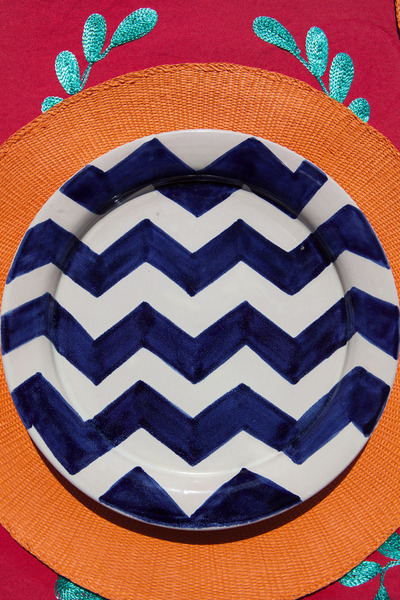 Did you see our beautiful blue and white zig zag dinner plates which we have had made in Mexico especially for our online store? They are another favourite of mine. I hope I'm not boring you with my favourites. However, these very special hand-made vases are also another favourite. 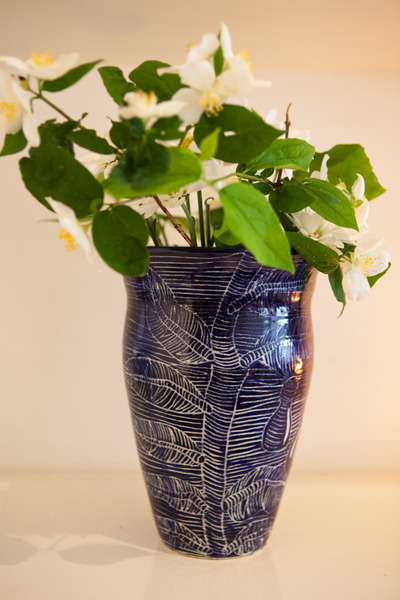 Hand-made by members of an art's collective for adults with developmental or intellectual disabilities, the sale of these beautiful blue and white vases supports a community of artists right here in Brisbane which I think is a wonderful thing especially at Christmas. They make such a great gift and are so reasonably priced for what they are! What's your favourite thing in our Vignette this season? I would love to know.